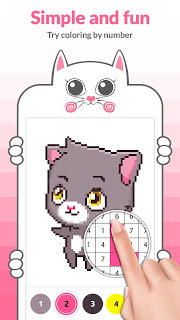 Cat Pixel Art number coloring book is SO adorable you just can’t help but yell, “It’s so FLUFFY!” Start to Paint by Numbers Cats in cute kitty coloring pages! Cat coloring pages with tons of cute cat pixel art images to color by number are perfect for all cat lovers! 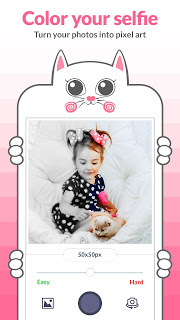 This animal coloring book & kitty coloring pages contains too loveable, too curious, too cute cat pixel art images to color by number all day long! Enjoy cat pixel art from adorable and beautiful to cheeky and funny cat pictures to color in cat coloring pages! If you can't get enough of cute cats, get Cat Pixel Art number coloring book and you will love all cat pictures to color by number! Kitten coloring pages day can start! 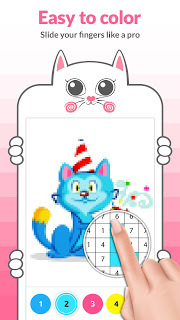 Stretch like a cat, relax and start coloring by number! Purr! Coloring by numbers games for adults are the newest coloring craze! Try dozens of free paint by number images or create your own pixel art masterpiece! Paint by numbers coloring books for adults are popular all over the world and you will not be able to resist the best pixel art number coloring game! 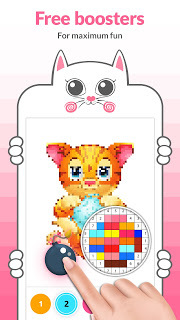 Join kitten paint by number craze and start to color by number fascinating pixel art images! Totally new pixel art coloring book by numbers with fascinating pixel art paint by numbers images is finally here. Ultimate de-stress and relaxing coloring by number coloring book is suitable for any taste and ages. This pixel coloring book is perfect pixel art paint by number therapy that will let your stress go away. Try cat pixel art coloring book with easy & challenging pixel art pictures JUST FOR YOU to relax. Color by number anywhere. Relax. Enjoy!